Addi's Second Birthday: Healthful, Allergy-Friendly Menu, Made with Love! 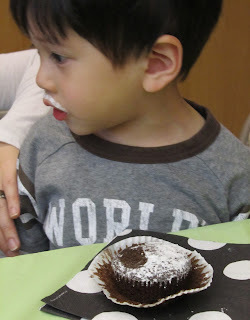 I had not before attempted to throw an entirely allergy-friendly birthday party, but because we had a good handful of kids at this party with food allergies, I decided to do my best to make it a dairy/egg/nut/peanut/shellfish free party. I know, some of you are wincing...but the guests didn't have to know that it was allergy-friendly! We had the party at a SF Park & Rec playground and clubhouse with only a fridge and microwave, so I kept to mostly cold stuff. I also love the idea of this menu for a picnic. I have to say that it was the most exhausting prep for a birthday party I've done (and recruited help, I did! 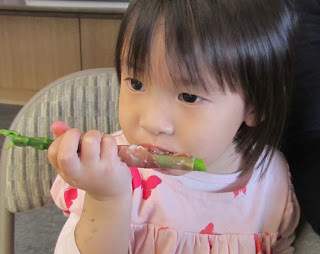 ), but it was really rewarding to know that all the kids could eat anything on the menu. Tristan even tried spinach dip with peppers, Addi was chowing down on the prosciutto wrapped asparagus, and smoked salmon & Tofutti cream cheese sandwiches were apparently the new PB&J! I loved how the adult and kids menu completely overlapped. 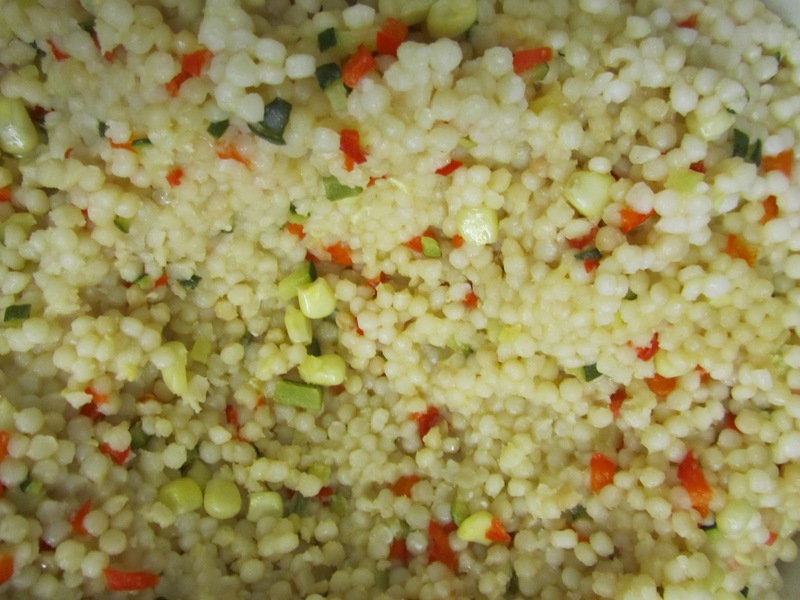 The couscous comes from TJ's in a box in the pasta section. You could also use the Harvest Grains mix which has added orzo, quinoa, and beans for a similar dish with added protein. Measure out chicken broth instead of water according to package directions. I usually add also a pat of allergy-safe margarine (Earth Balance). 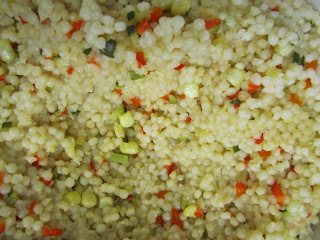 Dice veggies, and when broth comes to a boil, add couscous and veggies. At second boil, turn heat way down and cover until cooked (about 8-10 minutes, depending on how many veggies you add and whether some are frozen). If you need to add extra liquid, you can add water til it's cooked. So easy! Just wash, trim, and blanch the asparagus. Then, drizzle with bit of olive oil, add pepper, and wrap with prosciutto. (I used half pieces of prosciutto). For a zestier version, spread honey mustard on asparagus before wrapping in prosciutto. Isn't his sugar mustache the cutest? All the kids were sporting them! We've done 40 cup containers from Martha & Bros. and Starbucks--comes with all the condiments and cups & stays hot for 5 hours. Noah's does smaller boxes of coffee to go. Coffee = essential for a 10 am kids' birthday party. Happy birthday, Little Miss! We love you! Not the prettiest pic...people had already dug right in! 1. Leave the spinach out to thaw for about an hour if you remember. It'll save time later. If it's still frozen, you can either cook it by boiling, drain, and squeeze (squeeze and squeeze the water out! ), or put it in a colander and rinse and break apart with hot water, then squeeze. It should feel very dry and be stuck together in a clump. 2. Then just stir all the ingredients together and chill. So good with veggies or a sliced baguette! Or, put it in a carved out sourdough bowl for fancy presentation. Stickers for the kids, mostly clean bathrooms, fresh ingredients with a made-to-order menu, all at rollback prices. We heart In-N-Out! 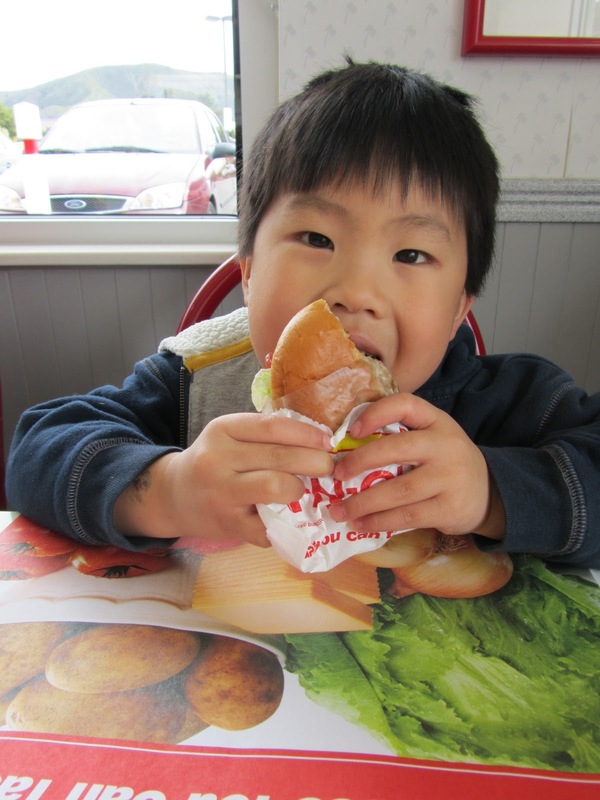 For your vacations/staycations this spring break, consider stopping at an allergy-friendly In-N-Out! Although In-N-Out doesn't publish their ingredients like other fast food restaurants, their helpful customer service staff will answer all of your questions about ingredients, so ask away. If you catch them during business hours, give them a call (1-800-786-1000), and get an instant response. 1. The food is made to order, and if you let them know you have food allergies, they will fire up a "dedicated grill" to avoid contamination from their other burgers (ASK for a dedicated grill). Plus, most of the employees are generally allergy-educated (from my experience). 2. You can get fries from the freshest batch if you ask for fries with "no salt." When the next batch is fried, they'll scoop out your piping hot serving before salting... If you still want some salt, ask for some on the side. And don't worry, the cottonseed oil is just for the freshly cut potatoes. 3. If you're egg-allergic, ask for "ketchup instead," and they'll replace the egg-based sauce with ketchup on your burger. 4. If you're wheat-allergic, ask for a burger "protein style." They'll replace the bun with a fresh lettuce wrap. 5. If you're dairy or egg allergic (or both), you can still have your bun! That's right...no egg or dairy in their buns. 6. If you've got the kids in tow, ask for stickers while you wait (we've also gotten some great paper hats by request for the kids to help pass the time on road trips, and made for a great Halloween costume a few years back). 7. They open at 10:30 so for all you early lunchers like us, you've got somewhere to go when the kids start screaming HUNGRY! And ask for your burgers "cut in half" (self-explanatory when you've got kids). Check out In-N-Out's Not So Secret Menu for other variations on their made-to-order foods. Remember: think made to order. Even if it's not on any menu, they'll probably make it, so don't be afraid to ask. Fast food can be safe and delish. Happy In-N-Outing! Six-Year-Old With Peanut Allergies Wanted Out? ORLANDO, Florida (Reuters) – Some public school parents in Edgewater, Florida, want a first-grade girl with life-threatening peanut allergies removed from the classroom and home-schooled, rather than deal with special rules to protect her health, a school official said. "That was one of the suggestions that kept coming forward from parents, to have her home-schooled. But we're required by federal law to provide accommodations. That's just not even an option for us," said Nancy Wait, spokeswoman for the Volusia County School District. Wait said the 6-year-old's peanut allergy is so severe it is considered a disability under the Americans with Disabilities Act. After reading the story, I thought a lot about it before deciding on what thoughts I had to share about it. I have, for the most part, received empathy and understanding from my children's school communities regarding their food allergies. So it's really hard for me to imagine a world where parents are actually protesting my child's enrollment in his school because of them. I always feel it goes back to lack of food allergy education among the school community, and even what we as parents or doctors understand about food allergies. With a lack of more details, I hesitate to comment on the extent to which the school has been asked to accommodate this child with respect to the severity of her food allergies. Most disturbing were the comments that were posted after the article--over 3000 comments have been posted to date. Whereas my first instinct was concern over the well-being of the child and how the ostracization of the school community was affecting her; most of the comments were actually in favor of making her being home schooled and basically expressed the selfishness of the family for making the school community take responsibility for her health. How have your food allergic children's schools responded to their needs? What is your take on what is happening in Florida? We're here to tell our stories, share recipes and allergy-safe craft ideas, and direct you to ingredient and product lists to help demystify food allergies for everyone. And for you mommies who haven't yet checked out CityMommy (hullo...where have you been? ), do so today and join free for invaluable info, great conversation, discounts, and giveaways specific to your city! They've literally got CityMommy cities all over the country. So start connecting with other mommies in your area today! When we enrolled my son, Ryken, in preschool it was a big step for our family. It was the first time I would leave him in the care of someone else on a regular basis. I was nervous about how he would react to not having mommy at his beck and call. And I was nervous about his food allergies. Thankfully I found a great preschool program. Not only were the seasoned teachers loving and supportive but they were also extremely accommodating of Ryken's dairy and peanut allergies. When Ryken transitioned to Kindergarten this year I knew things would be a bit different. Bigger class, fewer teachers, and more chaos overall. I remember being a teacher of 20 and the challenging task of being attentive to everyone's needs all the time. Nowadays it is even harder for teachers. Class sizes are bigger while expectations have remained consistently high. I began to look for helpful reminders of Ryken's food allergies. After some online research, I came across a promising company called STATkids. STATkids makes school and travel products that enable you to clearly indicate your child's allergies. With white writing on bright, eye-catching red, it's hard to miss the allergy alert. The company's products include wristbands, health cards, and fanny packs. Lunch bags and backpacks are also available and can be personalized with your child's name, too. I bought small-size wristbands for Ryken that fit him perfectly. He loves to wear them and they don't irritate his skin one bit. If he wanted to, he could keep them on worry-free through hand-washing, swim class, and showers without fear of rusting or ruining them. I also bought a fanny pack where we keep his Epi-Pen, Jr. set and a bottle of antihistamine. It's nice to be able to easily tote that whenever we go out. Be sure to check out STATkids website for their full line of products and Amazon.com for competitive pricing. 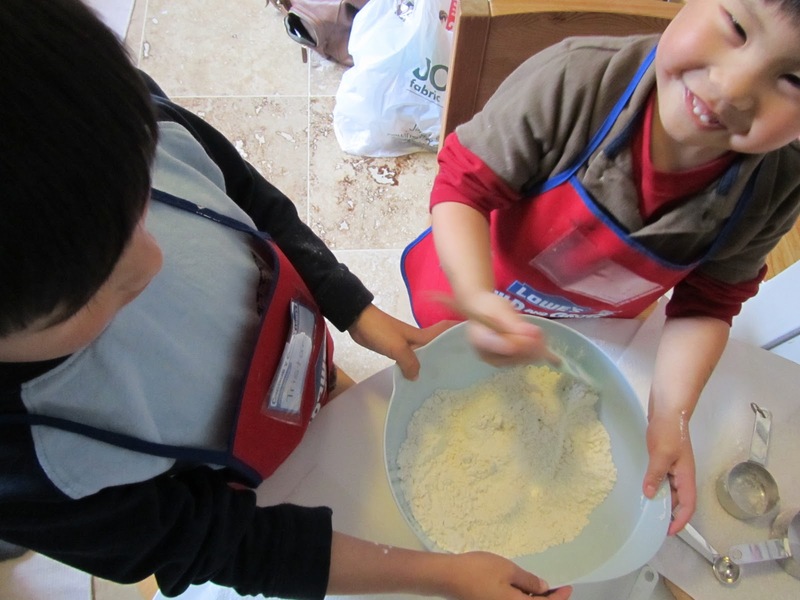 At the kids' preschool, they make Irish soda bread every year, often made with buttermilk, and Tristan, now six (and a half, he says), had yet to try it. So this year, I finally got my act together. Nothing like a rainy day to inspire allergy-safe baking with the kids. I thought, I'm finally going to share some Irish tradition with the kids for St. Patrick's Day (which has become a much more noticed holiday around here since it is shared with Addison's birthday). Well, it turns out that sugar and raisins (or cranberries, or any other like additions) are completely non-traditional. Of course. Traditional soda bread is actually made of four main ingredients: flour, baking soda, salt, and buttermilk or other acid. There are many more traditional Irish soda bread recipes out there. You can try them for yourself, substituting the buttermilk with 1 cup safe milk+1 T. vinegar for dairy allergies. 2. 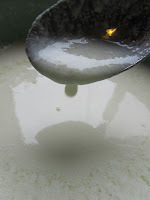 Add vinegar to milk and set aside to curdle. 3. Mix all dry ingredients together in large mixing bowl, including the cranberries. 4. Add the wet to the dry ingredients and mix together just until a dough is formed. 5. Sprinkle flour on lightly greased pan, silpat, or parchment paper lined pan. 6. Place on pan, sprinkle more flour on top (it was very sticky so I ended up coating my hands with flour), and form into a ball. 7. Use a knife and slice an "X" on top. 9. Set it on a rack to cool to prevent the bottom from getting soft. Tristan asked for 3 more slices after dinner. Obviously, the bread won out over the spaghetti I had thrown together and called dinner. Logan didn't like "those little black things." I think the cranberries may have been a bit tart for him. The recipe was easy and the bread came out moist and tasty. The cranberries gave it a little kick. A dairy-free ode to a cookie rock star! When I asked friends and family about their favorite Girl Scout cookie, most loyalties were divided fairly evenly between Thin Mints and Samoas. But put a box of each kind of cookie in front of the group and you can bet there will be more pure giddy over the Samoas. Those cookies have serious die-hard fans. I think it has something to do with how complicated they are. Thin Mints are delicious (my personal fave) but beyond the burst of peppermint it's pretty much a chocolate cookie. With their fancy lines of chocolate and sticky clumpy coconut tops, Samoas are the wild child of the Girl Scout Cookie family. So after successfully making a safe Thin Mint for my dairy- and nut-allergic kids, I naturally moved on to tackling the Samoa. After seeing the many steps involved to making them, I decided to go easy on my first attempt. I chose a less labor-intensive bar recipe to work with. The biggest hurdle in making the bar dairy-free was the caramel sauce which is traditionally made with heavy cream and butter. I used Bobtail's recipe for non-dairy caramel sauce that was featured on Food.com. Taste-wise, it's a great match. Texture-wise, it is thin and runny but because you'll be mixing it with toasted coconut it will work out okay. You can also thicken the sauce by mixing a teaspoon of corn starch to the creamer as you heat it on the stove. Preheat over to 350 degrees. Line a 13"x9" rectangular pan with aluminum foil. Grease with canola oil or cooking spray. Cream together vegan margarine, sugar, and vanilla. Add flour and salt to wet mixture and combine thoroughly. If the mixture is too dry, add a little more vegan margarine or some milk substitute until dough can come together. Press dough into the bottom of foiled pan. Bake for about 20-25 minutes or until lightly browned. Cool in pan. While cookie base is cooling, heat semisweet chocolate chips (about 2 minutes in microwave). Add vegetable shortening and stir until mixture is smooth. Spread a layer of chocolate to completely cover the cookie base. Cool until completely hardened. After the pan is cool, you can pop it in the refrigerator to set the chocolate. Keep your leftover chocolate dip -- you'll need it for drizzling over the top of your bars. Toast 3 cups coconut in preheated 300 degree oven for 15-20 minutes or until it begins to turn golden brown. Check coconut every five minutes -- I burned a lot of coconut at 350 degrees! Meanwhile take cookie base out of refrigerator. Over a surface lined with plastic wrap or parchment paper, carefully remove foiled cookie base from the pan. Turn cookie base over --the chocolate top will now be on the bottom of your bar-- and peel off the foil. Toss toasted coconut and 1/2 cup of caramel sauce together until well coated. You might not need all the caramel sauce (remember, it's runny!). Add more sauce as needed to fully coat coconut. Spread caramel coconut mixture on the "new top" of the cookie base. Reheat leftover chocolate sauce. Add additional melted chips mixed with shortening if needed. Drizzle over coconut topping. Let chocolate drizzle and coconut set. Then cut into bars and enjoy! Overall I thought the shortbread crust, while delicious, didn't remind me of the slightly chewy Samoa cookie. My husband thought there was too much crust per bar, so next time I might opt for spreading the base on a cookie sheet or jelly roll pan, and upping the toasted coconut/caramel mixture. The caramel coconut topping and chocolate accents were excellent-tasting substitutes. You can be sure I will be dairy-freeing this cookie version in the near future...after I can fit into my jeans again. I did end up making a Samoa cookie using the BakingBites.com January 2008 recipe after we gobbled up the bars way, way too quickly. My husband liked the cookie version better than the bar. I preferred the Samoa bar. Once you've done the cookie versus bar challenge in your household, let us know your winner! We always have Tofutti Better Than Cream Cheese in our fridge. My kids are major bagel eaters, especially Tristan, who would eat a bagel every single morning of his life, if I’d let him. It’s great on your other breads too—english muffins, toast, etc. Try mixing it with cinnamon-sugar for a sweet topping, or in your dairy-free cream cheese frosting! Yum. Spread it on sandwiches instead of mayo or butter. My kids love cream cheese and jam sandwiches, cream cheese, turkey, and tomato sandwiches, and cream cheese sandwiches! Use it on tea sandwiches for parties—with almost half the fat of traditional dairy cream cheese, your guests will love you for it. I made smoked salmon and Tofutti cream cheese tea sandwiches for an adult party and the platter emptied fast! (Mmm…thinking about cucumber and Tofutti cream cheese sandwiches). Add some garlic powder and dried dill for an easy and tasty veggie dip! Anywhere you’d normally use cream cheese, Tofutti Better Than Cream Cheese will do the trick. It has more of a whipped cream cheese texture, as it does come packaged in a tub. But the flavor is really similar to the dairy stuff, and if you’re spreading it on something anyway, you can’t tell the difference in texture. 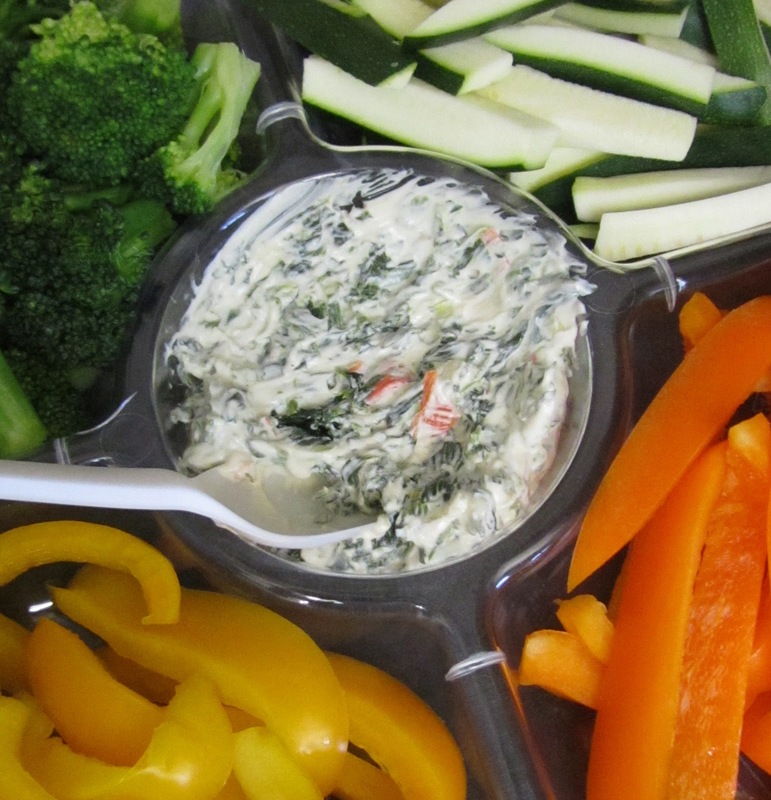 The cream cheese comes in many varieties, including French onion, herbs and chives, smoked salmon, garlic and herb, and garden veggie. SO good. Tristan may one day turn into a blueberry bagel. He is obsessed with them. We’ve found Noah’s bagels to be a great on-the-go or breakfast treat. 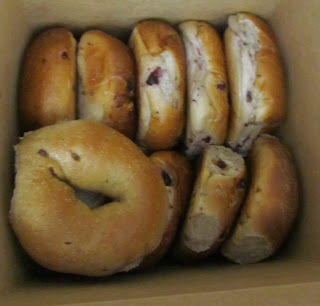 They have lots of varieties of bagels that are Tristan-friendly (dairy, egg, nut, peanut, shellfish-free), including blueberry, plain, cinnamon raisin, and chocolate chip, and really, nothing beats a bagel hot out of the oven. I will ask for separate bags if I’m getting a bagel containing an allergen for myself, and they’re always happy to do that. Also, ask for a plastic bag—and they'll give you a big plastic bag to store your bagels and ensure freshness for a few days (it really works!). Noah's publishes an extensive ingredient list on their website, though you have to do a little navigating to find it. If you click on the pretty tiny red words “nutritional info” on the bottom of any of the menu boards, you can open up a 24 page pdf document that appears to just be nutritional info. The ingredients and allergy info starts on page 9. Bonus! They've just added Aidells sausage bagel dogs to their menu. My egg, dairy, nut, shellfish allergic children thank you! As a warning, it seems they have one slicer for all of their bagels, so if you’re worried about contamination, I would ask for a knife to cut your bagel in half instead. They also have a universal toaster, so that's also a risk of contamination. One of my favorite breakfast treats is berry bread. Really, it's just a muffin disguised as a bread or cake as you'll see from the original recipe that inspired this. 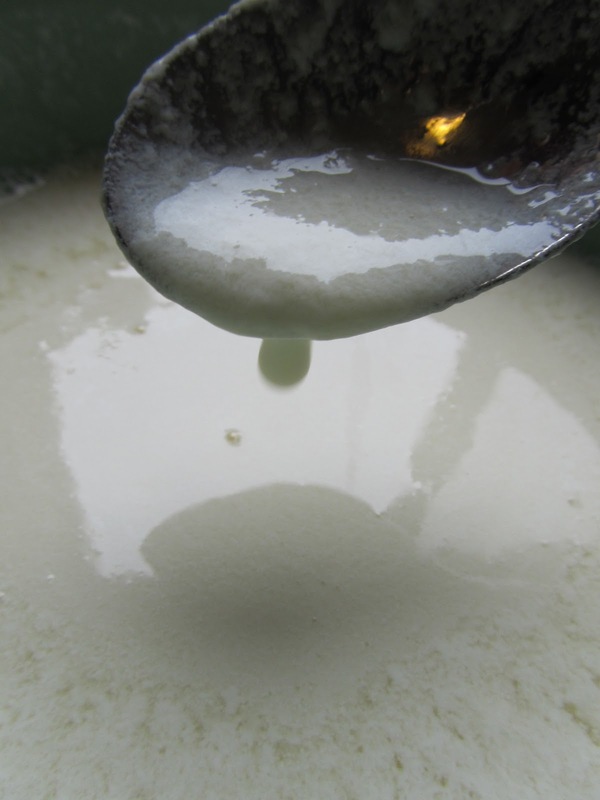 If you are dairy-free like our family and need to replace buttermilk in a recipe, a good alternative is to use 1 tablespoon of vinegar plus enough milk substitute to make 1 full cup of liquid, and let that mix sit for 10 minutes. The vinegar and milk mix works especially well with soy milk (you get that curdling effect). If you are soy-free, use almond (if it's safe for you) or whole grain milk. Whole grain milk tasted great in the recipe but know that the vinegar won't curdle the milk. I like to make our berry bread in one big pan for many reasons. It's easier to pour out the whole batter into one pan, pop it in the oven, and check on it 45 minutes later. I can also save money on muffin liners. Beyond those reasons and on a serious note, safety is always on my mind. Oily batter bleed through those liners and I worry that I'm going to miss scrubbing any remnant egg or other allergen off. If I line a pan with aluminum foil, it provides an impermeable layer of protection against cross-contamination. I can rest easier when I'm baking for friends with different food allergies. In a separate bowl, combine oil and sugar. Stir in vanilla and flaxmeal/water mixture until well combined. Slowly combine flour and wet mixtures. Then add milk substitute. Hand mix or whisk to break up any big clumps. Toss berries with 1 tsp each of sugar and flour. Spread half of batter into a foiled or well-oiled 8"x8" or 9"x9" square pan. Sprinkle berries on top of batter. Then cover with remaining batter. Gently stir to mix the berries and batter. Doing this helps to prevent the juices of the berries from "bleeding" all over. You can also toss the berries in a teaspoon of flour to try to absorb any excess liquid. It's not bad if they bleed but it may not look the prettiest! Bake for 45 minutes in square pan or until a toothpick inserted in the center comes out clean. For muffins, fill muffin cups 2/3 full and bake for 25-30 minutes or until muffins spring back when touched at their center. I've also made this recipe with a mashed super-ripe banana in place of 1/4 cup of the sugar. Yum! Do your kids wear allergy bracelets or necklaces? If not, why not? Halloween was on a weekend that year so we went to the doctor's office first thing Monday morning. He took a blood test and told us that his reaction to peanuts was off the charts. We then decided to make an appointment with an allergist to get a more thorough evaluation. There it was confirmed that he was allergic not just to peanuts, but to many other allergens such as seafood and other tree nuts but, again, peanuts were off the charts. We also finally became acquainted with the Epipen. After describing all the symptoms that K experienced on Halloween, the allergist told us what we already knew, that we were very lucky. Our house is now completely peanut-free and nobody is allowed to bring in peanuts or peanut-containing food from outside. I also gave up peanuts even though peanut butter was one of my favorite eats of all time. Even so, it was the easiest thing to do and I never looked back. Even though Halloween lands in October I felt compelled to tell this story now. I believe it's a story for all seasons. Following are some tips that will help you avoid a situation like mine. 1) Familiarize yourself with signs of an anaphylactic shock. 2) When in doubt call 911! 3) Never assume that peanut-free candies you used to eat a long time ago are still peanut-free. New candies are being fabricated as we speak. They even put peanut butter in candy sticks now. What?? Familiarize yourself with peanut-filled candies and foods, especially the new ones. A simple Google search on peanut-filled candy will lead you to them. 4) If you suspect that your child has a peanut allergy or any food allergy for that matter, seek a thorough allergy work-up ASAP in case you need to be properly equipped with the right medications. Last weekend as we were gathered around the kitchen table for dinner, there was a knock at the door. Because we aren't used to getting visitors (especially in the evening) and because we're a family of curious creatures, we all rushed to the door to see who it was. It turned out to be a Girl Scout who was going door-to-door to peddle her treats. In past years I would have happily shelled out $3 (I know, I know, the price has gone up...) for a box of those annual bites from heaven. But with two kids with a dairy allergy, one of which also has nut allergies, I've added buying Girl Scout Cookies to my retiree list right under Reese's Peanut Butter Cups and delivery pizza. After politely declining and saying goodbye to our local Scout, Ryken wishfully said almost under his breath, "Mom...I've never had a Girl Scout Cookie." For some reason the particular way he said that affected me. It saddened me as if I could feel the burden that he carried due to his food allergies. Without a moment's hesitation I promised him I would make him some safe Thin Mints just like the real thing. After a bit of online hunting and three test batches, I think I have a winner! The recipe is dairy-free and egg-free. I believe you can also make the cookies soy-free, too, by using Spectrum Organic Shortening and Enjoy Life semisweet chocolate chips. Enjoy Life also has a printable coupon right on its main page. Combine, maple, vanilla extract, and peppermint oil. Sprinkle flour and cocoa over wet mixture. Mix thoroughly being careful to break up any clumps of cocoa. When dough has been combined, hand-roll the dough into a log, about 1 1/2-inch in diameter. Freeze for at least 1 hour. Take hardened dough from freezer. Unwrap it and, if needed, wait for it to warm up enough so that a sharp knife can cut through it. Cut log into circles 1/4-inch thick. Reshape to round out the edges if needed. Bake circles for about 10-12 minutes. (I baked mine for 12 minutes because I wanted a more crunchy cookie like real Thin Mints.) Cool completely on rack. Using a fork and your fingers, dip cookies one at a time into the melted chocolate, using the fork to scrape off any excess. Place finished cookies on pan lined with parchment paper. Refrigerate or freeze cookies to set chocolate. (They set quickly! Less than 10 minutes should be fine.) Your fingers will get messy, but it's so worth it! Makes about 2-3 dozen cookies. The Thin Mints are delicious room temperature or straight out of your refrigerator. Just remember to store them in an airtight container to retain their texture and to prevent any nearby foods from adopting that minty fresh taste. Oh, and remember to have a camera and plenty of napkins on hand. Chocolate-covered treats plus kids spells g-i-g-a-n-t-i-c m-e-s-s.
A bonus of condos is having a fun washer/dryer! If we're staying with friends or family, I explain ahead of time about our kids' food allergies and check if I can use their kitchen for preparing safe food. I give them a heads up that I'll be a kitchen fixture :) by having to read ingredient labels and asking questions about every food that's served. I bring two sets of medication along plus the kids' doctor information in case I need to refill a prescription. Food shopping right off the bat might not be an exciting start to your vacation but it is a necessity. To make it as short as possible, I plan out meals and figure out which stores to shop ahead of time. Bring along recipes, shopping lists, and small, dry foods. (My faves are spices, oatmeal packs, semisweet chocolate chips, whole wheat pasta, and fruit leather.) I like to keep an old receipt to remember what staples we use and how much our family typically eats.